Last night I went to the bar run by Adam George of this forum; the Garden Bar at the South Place Hotel in London. I very nearly had too many. Like an idiot, I failed to photograph the first one; Mai Tai, and I failed also to remember Adam's recipe (perhaps he can fill that in at some point). My friend went into positive raptures over this drink and started using a lot of superlatives. That was certainly deserved; I would call this drink quite restrained as the sweet and sour aspects were kept down without squashing the exotic flavours, so the rum could get in and cuddle with some lovely refreshing mint. That was great. This is a cocktail I had believed to be rather revolting, but now I have modified my opinion. This version was far lighter and more discrete than others I've tried, with some very beautiful spices balancing out the sweet-creamy business, and way less pineapple than in previous examples I've met, which relieved the sugar factor. 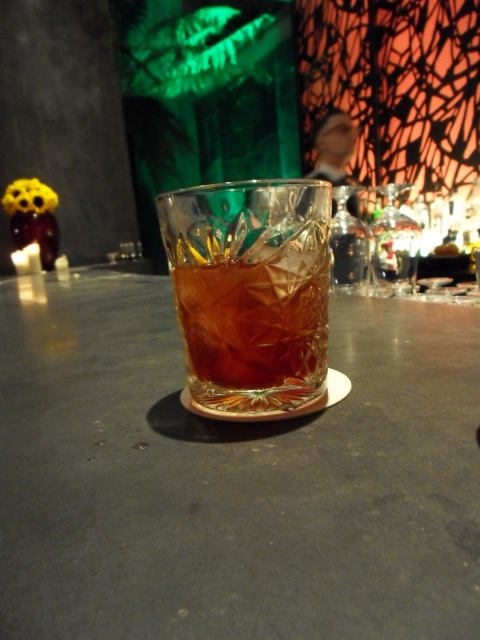 Next, I was very lucky to taste this twist on a Negroni (second pic), which Adam's colleagues were preparing for a party coming up in the hotel and which they described as 'guzzleable' . Following that, a Summer Romance; Kamm & Sons, Tanqueray and Dubonnet on rocks. That was also great to drink, with a very delicate orange aroma smoothing out the metallic side from the bitter elements. Here's a shot of Adam being hospitable to someone, which I 100% deliberately blurred to protect his identity (third pic). 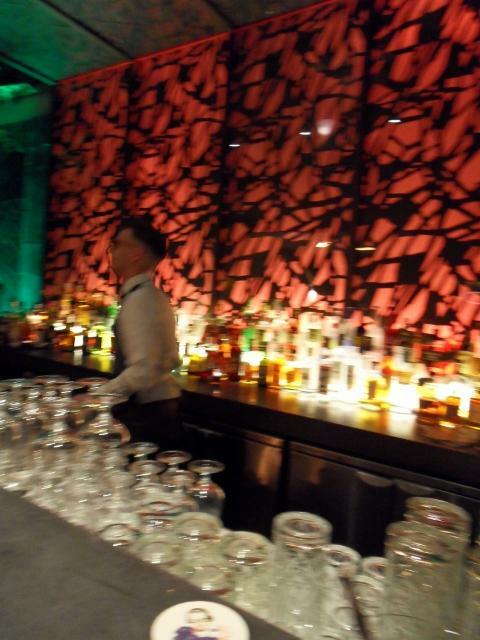 You can see the exciting decor behind the bar; the green parts are made of flowing water. The seating area is open to the elements, but has big canopies to protect visitors from typical glorious and clement British weather. Adam also turned out to be an exceptionally agile barman, a super-friendly person and very fun to know; thank you Adam for a great night. So, I really recommend this bar. If you want to go, however, you'd better make it quick; the bad news is that soon it will become members-and-residents only. There are two other bars in the hotel where we also had some very nice young oaked Chablis, so you may console yourselves in there. The drinks and the bar look beautiful, and the barkeep has a certain blurry charm. The truth is, he looks like that in real life. It's uncanny. Thanks so much for coming down and giving us this write up: It was a pleasure having you. Thanks for listening to me geek out, too: I remembered that fourth drink I was talking about. Anyway, I'm flattered by your kind words regarding the drinks. I'm really happy with the short list in the Garden. Shake, Rocks, Crown with crushed ice. Lime shell and Mint. So I'm aware of the original recipe calling for Jamaican Rum and Rum Agricole. I actually stock the alleged originally used, Rhum Clement VSOP, but frankly didn't favour the dry, eau-de-vie character it brought to the drink: I wanted a big hit of fresh grass and sugar cane to counter the muskiness of the Rum, to make the drink as refreshing as possible. I've made plenty of Appleton/Clement Mai-Tais and they're good, if not great, but I now prefer this spec. I'd like to say I'm incredibly happy with Plantes Vertes's observations that these drinks are "elegantly restrained". I didn't want big brash, mono-flavour drinks that you can only drink one of. It's partly due to my training in the Classic Cocktails, that I prefer subtlety, or to quote that video, "layers of flavour!" In the Garden I pre-batch all the spirits, liqueurs and syrups into their own bottle to improve speed of service. All the drinks have multiple garnish elements that make them fiddly to do at speed so I don't want people reaching for ten bottles to make the Zombie and it gives me something to do during quiet moments. It's also a little nod to the secrecy of the Trader Vic's bars and their coded bottles - though there are no secrets here, everything is labelled clearly and I've shared the recipes for the Zombie and Pina Colada here already. So, really thanks again for sharing your visit with the crowd here. We are indeed becoming members and residents only very soon, but please, if anyone is going to be in the area and would like to pop in, you only need to drop me a line and it would never be a problem. Awesome. I've pre-batched cocktails before for events with crazy numbers of people but I love the connection you make to the mysterious mixes of the Tiki days. Also, I'm going to have to try cachaca in my Mai Tais now. I'll have to hit you up next time I'm in London. Has anyone tried a drink along these lines before? It seems like someone would have had to, given the similarities between the 20th Century and the Last Word and the well known affinity Chartreuse has for chocolate. It'd be too sweet as written with creme de cacao but might work in different ratios or with something else chocolate-flavored like Meletti or chilled cocoa or even bitters. Or maybe Tempus Fugit's creme de cacao, which I haven't tried. Interesting choice of rums, I would be curious to try it. The closest I could do at home would probably be Coruba for the dark Jamaican + Sagatiba for the cachaca. I would still stick to Cointreau or Creole shrubb though; not a fan of Grand Marnier in Mai Tais. style="margin-top: 0px; margin-right: 0px; margin-bottom: 0px; margin-left: 0px; ">So, really thanks again for sharing your visit with the crowd here. It's a romance thing but primarily it's about convenience and speed. 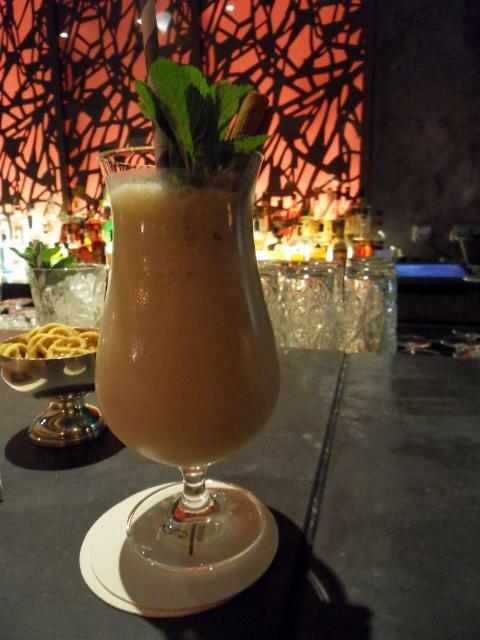 Our fifth drink outside is a Fog Cutter and the mix also acts as a preservative for the delicate Puerto Fino we use. Please do swing by when you're in town. I'd prefer Ferrand actually, but that's not an option. I didn't care much for Cointreau, but each to their own. The vanilla is just something I read about Rock Candy Syrup having a hint of vanilla to it. I don't have Rock Candy Syrup, and don't really no what it is, so I'm using Vanilla. It also cuts the Orgeat, of which a full 15ml was too much. If this is too sweet as written (something I have rarely come across I confess!) then you would probably not find the TF Creme de Cacao to work as it is all liquid chocolate and vanilla. Far richer, and sweeter, than most others to me. if yuo are looking t odry it out Meletti might be a better course of action. Since I have the TF I may well have to give this try! Would it be too sinful to make one with V.E.P. for a comparison? As if that has ever stopped me. Just have to find a worthy gin to use now! Something barrel aged perhaps. I don't have Rock Candy Syrup, and don't really no what it is [snip snip]. The flavour obviously comes from the sort of sugar and water you use. You achieve supersaturation by adding the sugar to the water over heat and stirring. That way you can get more sugar into the water than you could under normal atmospheric conditions. If you want to make it, do so in a bain marie and pour the ingredients into a mason jar so you don't end up trying to pour the stuff around into new containers and covering yourself in molten sugar. You also need to sort yourself out something amusing you can do with one arm, because you'll be stirring it for a good hour with the other one. Ahem. Mozart Dry Chocolate Spirit is unsweetened, I think, but I haven't tried it. Adam George, where is your bar? I'll be in London in a month. Yes. It's bone dry and very good. Just a note that simple syrup (1:1) is not saturated with sugar, not even close. You can even make rich simple syrup (2:1) and you would still be (slightly) below the saturation point. Now for the classic cocktails. Hope these additions go well with the others we have. Sounds delicious. Going to try it. I have a healthy sweet tooth, it's just that 1.5 oz of liqueur gives me a toothache just thinking about it, especially when one of them has candy associations like creme de cacao does. Then again, one of my favorite drinks is the Last Word, which is also half liqueur. At any rate the TF sounds delicious and I'll have to give it a try. If you do let us know whether it works! I was thinking genever might work well instead of gin, so Bols Barrel-Aged might be worth a try. >>Since I have the TF I may well have to give this try! Would it be too sinful to make one with V.E.P. for a comparison? As if that has ever stopped me. Have considered buying the Bols Barrel-Aged genever but never quite gotten around to it. I was thinking of giving the Rusty Blade or Citadel Reserve a try with it. Might be the weekend before I have time to play around though. Or maybe even Ransom which just occured to me as I posted this. If you are going to go sweet might as well go all the way! Thanks for this. I was thinking it was time to use up my Bulleit and Aperol. It's quite nice but we thought it needed something. I added a splash of Averna (somewhere between 1/4 - 1/2 oz). I don't think it made it too sweet given the 2 oz of rye and it added another dimension. It would be interesting to see what another amaro does. That's no big deal Plantes Vertes. Essentially you reach saturation when you can no longer dissolve sugar in water and some of it just remains as undissolved sugar crystals in the solution, which happens slightly above 2:1 at 25C. It is possible to dissolve more sugar if you increase temperature (or pressure). Then with subsequent cooling, a supersaturated solution can be obtained. You can try adding a few drops of Gran Classico to add a ilttle more depth. Now that my Baitz (an Australian brand) maraschino is gone I bought some of the Luxardo stuff people keep banging on about on eG. It was a little hard to find but didn't involve going to quite the same lengths I had to to get Whistlepig rye, Banks Five Island rum, Smith & Cross rum and Batavia Arrack (if you're interested, haresfur, you can get it at Nick's). I've tried it in a Hemingway Daiquiri and, tonight, in a Junipero-based Last Word. Really takes both cocktails to another level. The Baitz isn't bad at all and in the event my retailer stopped stocking Luxardo I'd go back, yeah, but the Luxardo is in a class of its own. It's the Cointreau of cherry booze. Norwegian Wood. Recipe here. An excellent drink. French Pearl. Recipe here. Also excellent, even if it's more heavily Pernoddy than anything else I've ever enjoyed.